This is the album all Broken Family Band fans have been waiting for! Remastered and nestling in the back of a beautifully designed hardback book, the Best Of CD features all the band's favourite songs, chosen and sequenced by them for you! 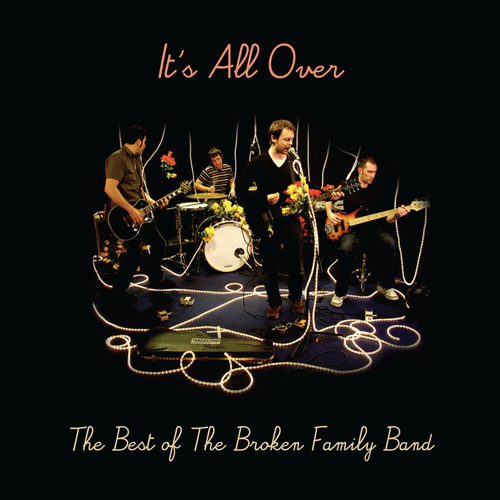 Way back in – yikes – early 2008 I wrote a “TLOBF Loves…” piece on The Broken Family Band. Back then the Cambridge four-piece were still a going concern, having released what was to be their penultimate album – Hello Love – the year before. The band finally followed through on their moniker and called it a day after 2009’s Please And Thank You, an album which lead singer and lyricist Steven Adams, ever the half-winking curmudgeon, has chosen to leave off this Best Of collection altogether. Reason? “I don’t like it”. That aside, though, any BFB evangelist is likely to be more or less happy with this collection, handpicked by Adams and bassist Gavin Johnson in an attempt to represent all aspects of the group. Their strategy of opting for the songs that became live favourites has paid off, and the album serves as a handy reminder, for those who might have been in danger of forgetting, just what an excellent band the BFB actually were. The collection opens with its earliest track, “Queen of the Sea” from their 2002 EP The King Will Build a Disco, although after this the running order is not chronological. Right from the off, many of the distinguishing features of the band are (were) on display. The skewed cynicism that almost sounds like idealism (“Sometimes nothing can take the place of nothing, in a heart”); the surprisingly sweet Adams vocal; the pretty tune and gentle instrumentation that almost trick you into underestimating them. This duality can be found time and again, and was one of the band’s most enjoyable features. The contrasting “Why don’t we all go down and play in the sun” and “Why don’t we all go down and play in the scum” verses of “Happy Days Are Here Again”, or the juxtaposition of the love object’s “beautiful eyes” and less-than-beautiful behaviour in “Devil in the Details” pull the listener up in a similar way, reflecting – respectively – an angry bitterness and a plaintive sorrow. As well as the negativity (which they did better than nearly anyone else, and made sublime), The Broken Family Band also gave great humour. The entirety of “Living in Sin” is set up/punchline followed by set up/punchline, until the moment when it sucker-punches you again with one of those moments where Adams, suddenly serious, admits that he is actually “thinking about drawing a line, and praying to the Dark Lord with you”. So far, so bleak, bitter, misanthropic. But what made this a really special band, a band that, for me, were Right Up There with the best was always the heart. Not simply the beauty in Adams’ vocal (yep, fake American accent and all) – although that’s there, in spades, in moments of sincerity as found here on “Poor Little Thing”, “Devil in the Details” and more – but also in the honesty of the sentiments. For a band that started off as a half-jokey parody of a Country band, there are moments in their work that are every bit as heart-wrenching as more conventional proponents of C&W. “Love Your Man, Love Your Woman” non-ironically makes the case that “all you need are trees, and flowers, and someone to hold you when you want to be… held”. The heartbreaking “For Milton Mapes” switches from scorn towards “all those haircut-kids on the indie-rock underground” to heartfelt, heartbroken “You can’t build a life on this… They can’t write songs like this”. “Poor Little Thing” is clearly only so mean about its subject (“You’re such a cliché”) because she’s annihilated the singer’s still-tender heart. Musically you can trace a line from the early alt-country days of The King Will Build A Disco, the brilliantly-named and realised Jesus Songs EP, represented here by the terrific “Walking Back to Jesus Part Two” and debut album-proper Cold Water Songs. By 2005’s Welcome Home Loser and 2006’s Balls (arguably the band’s finest moments) the sound beefs itself up, until Hello Love’s “Love Your Man…” dispenses with country almost completely, the second half of the track being devoted to a heavy guitar sound that definitely harkens back more to the alt-rock canon than to Nashville. Wonderfully, this collection ends with the band’s very best track – “John Belushi”. If a more nuanced, subtle, touching, honest and (that word again) heart-rending downbeat track has ever been recorded this side of Pavement’s ‘Here’ then I’d like to know about it. An ode to low-grade depression, to ducking out of the never-ending party of twentysomething life, to having a night off and “lying down in a smoky darkened room”, it is the perfect summation of what always made this band one in a million. If you, like me, adore the Broken Family Band you’ll already know – and cherish – every one of these tracks. If you’re looking for a place to start then you could do much worse than try this collection. Then go out and buy the complete back catalogue. Oh, but maybe give Please And Thank You a miss, yeah?